Now that the thrust of the holiday movie season is upon us, let’s talk about something not so cheerful: Going to a film and not being able to hear it. Thousands of people who are deaf or hard-of-hearing miss out because they can’t follow dialogue on the big screen. Big chains like AMC Entertainment and Regal Entertainment, having been sued countless times for not having captioning systems, have agreed to settle lawsuits by installing some caption systems, in some cities. As a result, some U.S. movie theaters have this technology in place. The bigger nut to crack is finding a particular film, when you want it, where you want it. It’s almost fanciful, like trying to catch Santa in your chimney on Christmas Eve. Movie chains say they don’t want to disrupt their hearing audience, so they tend to run captions on just one or two new films — of their choice — each week, often at odd hours. For example, where I live in Connecticut, the closet theater with captions is playing Invictus this week. That’s it. If I wanted to see Ninja Assassin with captions I’d have to drive to Westbury, N.Y., and it’s only playing once a day, at 4:10 p.m.
People who are deaf and hearing impaired would also benefit from a complete, searchable list of what’s playing around town. Forget the movie chains’ rambling hotlines or their websites, unless you want to spend hours hunting for films on their “accessibility” pages and finding very little. A great new website, Captionfish.com, does the work for you. Captionfish is a captioned movies search engine that finds Open Captioned and Rear Window captioned movies showing in theaters across the U.S. It was founded in 2009 by three deaf professionals, who are based in Seattle. With Captionfish, you can get email notifications when its search enginge finds a particular film in your area, or set up an RSS feed. 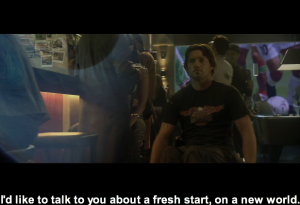 It also plays captioned trailers, a great feature that doesn’t exist on any other movie site I’ve ever been on. And Captionfish also lists movies that have descriptive narration voices, for people who are blind or visually impaired. A quick Captionfish search found all captioned movies playing within 60 miles of my house. Still, the results can disappoint. To see Avatar this weekend I’d have to drive more than 30 miles to the Connecticut Post 14 Cinema de Lux in Milford — the only place, locally, to see this flick with captions. Ironic, as Avatar is about a man with a disability. Another website, Fomdi, provides a similar directory, but is more barebones. Also, WGBH Boston’s National Center for Media Access, which developed the Rear Window captioning, has listings of theaters that have bought their system. If you’re in need of a captioned film, definitely check out these websites. You’ll save time and frustration — and if you’re lucky just might find the flick you’re looking for. You are right on point when you say the difficult task is finding the particular captioned movie you want to find in theaters. We’ve been working on this and offering the largest aggregation of movie showtime information for accessibility by the 35 million DHH in the US, since 2002. Our site is designed to provide easy, visually focused access to showtimes of particular films – with far fewer user-clicks than even CaptionFish or FOMDI, let alone the traditional movie showtime sites. We have not had outside funding and are still completing the automation needed for maintaining the national showtime listings. Contact from your Deaf and Hard of Hearing readers, and their families and friends will prompt us to update their local listings quickly. (Our site was the first of any showtime site to automatically present site visitors with showtimes close to their geographic location – a good site design feature now used by CaptionFish as well). Another point for those seeking captioned or subtitled film showtime information to consider is that CaptionFish only lists films presented with Rear Window Captions and OpenCaptions, and they don’t have a way to search for films by title. They are actually more of a theater directory than a search enginge site. In the American film market, the ticket sales drive the business. We need as many DHH movie-goers as possible to attend captioned films and communicate directly, by all means available, phone, mail, email, fax, social networking sites like FaceBook with the film studios and the theater operators and make their ticket-buying-voice known to them. We also need to make the theaters publish their DHH attendance figures regularly to publicly monitor compliance with ADA and movement toward equality of access.